Birds are highly visual animals with unique features and adaptations that allow them to fly. As they begin to migrate, they use visual cues to help guide them. Their eyes can change focus rapidly using an active process called accommodation. Birds also see ultraviolet light, and they have enhanced visual acuity because of different mechanisms, including a one-to-one projection of receptor cells to ganglion cells in the retina. Birds are the most visually dependent class of vertebrates. Even though humans are highly visual, the information transmitted to our brains is only 40 percent of that transmitted by pigeons and chickens. Birds of prey have even greater visual acuity. Pigeons can discern subtle color differences, and other avian species are able to record and remember over 6,000 images of caches where food is stored. Eye position in birds can be lateral in the skull or directed frontally, particularly in predator species such as raptors. 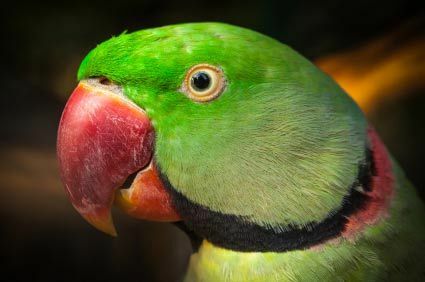 Species with laterally placed eyes, such as parrots, have a larger visual field (300o for pigeons) versus frontally directed eyes (150o for barn owls). However, as the visual field increases, binocular vision decreases. In binocular vision, both eyes focus on the same object, and eye movement is coordinated. Monocular vision occurs when only one eye is focused on one object at any particular moment. That type of vision is the norm for our parrots. Flat eyeball — diurnal birds (active during the daytime) with narrow heads; a short bulbar axis results in a small visual image on the retina and lessened visual acuity. Tubular eye—nocturnal birds of prey; the intermediate region is relatively elongated. The outermost layer, or fibrous tunic, maintains the shape of the eye. The cornea is relatively small, particularly in underwater swimmers. It is strongly curved in tubular and globular eyes. The refractive index between the air and the cornea is relatively larger compared with that between the water and cornea, and is nearly the same underwater. The sclera in birds is reinforced with a continuous layer of hyaline cartilage, except at the scleral ossicles. These ossicles form a continuous ring of overlapping bones that support and form a base of attachment for the ciliary muscles. Mammals maintain their eye pressure with the fluid that is made internally. Birds also make fluid in their eyes, and this fluid is drained out by the scleral venous sinus, or canal of Schlemm. This sinus is at the sclerocorneal junction or limbus of they eye, and it needs to stay open to drain fluid or it will cause an increase in pressure like in mammals that get glaucoma. The middle layer of the eye consists of a continuous layer — the vascular tunic. It is composed of the choroid, ciliary body and iris. The choroid tends to be thick, highly vascular and darkly pigmented, and it provides a significant portion of the nutrition to the eye. The tapetum lucidum, a highly reflective surface in many species, has been observed in only a few species of birds —the goatsuckers, which are nocturnal. The choroid continues as the ciliary body and then the iris. The ciliary body suspends the lens with its processes, the ciliary processes and its fibers, the zonular fibers that encircle the lens. The ciliary processes are pressed firmly against the lens with its muscles that provide accommodation. These muscles are striated in birds, and they are directly attached to the lens capsule. This unique feature allows birds to rapidly adjust their vision as they fly. These muscles are most highly developed in hawks because they require rapid accommodation as they descend in a dive to hit their prey target with great accuracy. Having a softer lens with powerful sclerocorneal muscles to force the lens to bulge through the pupil (diving birds). Water reduces vision because there is no longer corneal refraction, which accounts for 20 diopters. The iris is often dark but may be highly colored. Male cockatoos often have a black iris, while females have a brown one. The pupil is commonly rounded; pupils with an irregular margin may result from avian leukosis. Pupillary size is regulated by striated, rather than smooth muscles — the sphincter and dilator muscles of the pupil. Movement and size are rapidly changed in birds, but because of willful movement, a bird’s pupils often not respond to light in a pupillary exam because of stress. Birds also have the ability to regulate the quantity of light reaching the retina by migration of pigment in special cells embedded into the retina. With light adaptation, the pigment migrates to shield the receptor cells. As indicated, the lens of birds is softer than that of mammals to provide rapid accommodation. Part of this softness results from the lens vesicle, which is fluid-filled. It lies between the annular pad (Ringwulst) and the body of the lens. The annular pad encircles the equator of the lens and is most pronounced in diurnal predators. In primates, the lens filters light below 400 nm, making it impossible to detect ultraviolet light. On the other hand, birds are able to visualize wavelengths down to 350 nm, allowing them to visualize many things we cannot. They are able to discern males from females in what we think are sexually monomorphic species. They can detect ripeness of food items because of this quality and hawks can visualize urine trails of mice. Now that is something very different than mammals and provides them with unique abilities to see things that we cannot see. The retina of birds is relatively thickened and does not contain blood vessels, as occurs in mammals. This allows the entire space to pack in more “pixels” to see with. The retina consists of a non-nervous pigmented epithelium and a nervous layer composed of rods, cones, bipolar cells and ganglion cells. The ganglion cells collect to form the optic nerve at the optic or blind spot. The rods and cones are the receptors in the retina. Rods are sensitive to the intensity of light, so nocturnal birds have mostly rods. In order to increase sensitivity to low amounts of light, several rods synapse with a single bipolar cell and several bipolar cells synapse with a single ganglion cell. However, the sensitivity of the owl’s eye may be due to its ability to gather more light (2½ times brighter than humans). Their ability to hunt in near darkness may result from their sense of hearing. Cones are responsible for visual acuity and color vision. In diurnal passerines and predators, one cone synapses with a single bipolar cell, which synapses with a single ganglion cell. This one-to-one projection to the brain greatly enhances visual acuity, or the sharpness of detail. A single, round central area in each eye, close to the optic axis. A horizontal central area is present in water birds and those that live in open plains, which allows the eye to fix the horizon at its reference point. Two foveate areas — one in the central area and a laterally situated temporal one. This is common in fast-moving birds, which require accurate perception of distance at relatively high speeds. A single foveate area temporally placed, as in owls. There are three visual pigments in birds, with a possible fourth, that are sensitive to near ultraviolet wavelengths. In birds, cones additionally have an oil droplet within them with five different absorbency spectra. The droplets’ function is not entirely known, but they may directly produce color vision or may enhance contrast by acting as intraocular filters. For example, yellow droplets could remove much of the blue from the background, increasing contrast between an object and the blue sky.